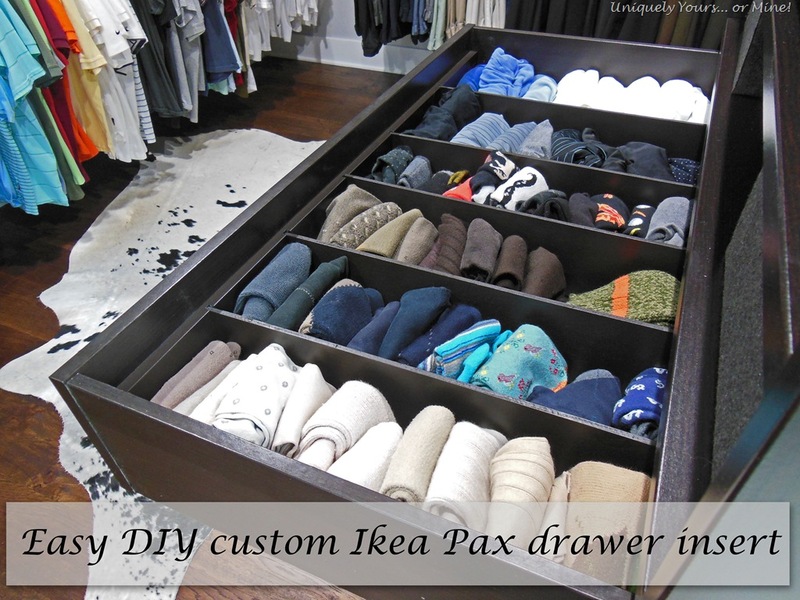 DIY Custom Built Organizer for our Ikea Pax Wardrobe – Uniquely Yours… or Mine! If you follow me on Instagram you may have seen some of the updates we have completed on the Master Closet / Dressing Room. I’m not ready to show the final reveal as I am currently in the process of spray painting the Ikea Pax Wardrobe doors, but I should be done soon! So we decided to add three Ikea PAX brown-black wardrobes to our closet rather than building a custom setup. We already have plenty of hanging space, but my hubby needed some additional drawers and shelves for things like shoes, socks, underwear and I wanted they’re cool jewelry organizer. We chose to buy one of the 14” deep cabinets for his shoes, but the 24” deep one for all of the organizers we wanted that aren’t available in the more shallow cabinet. 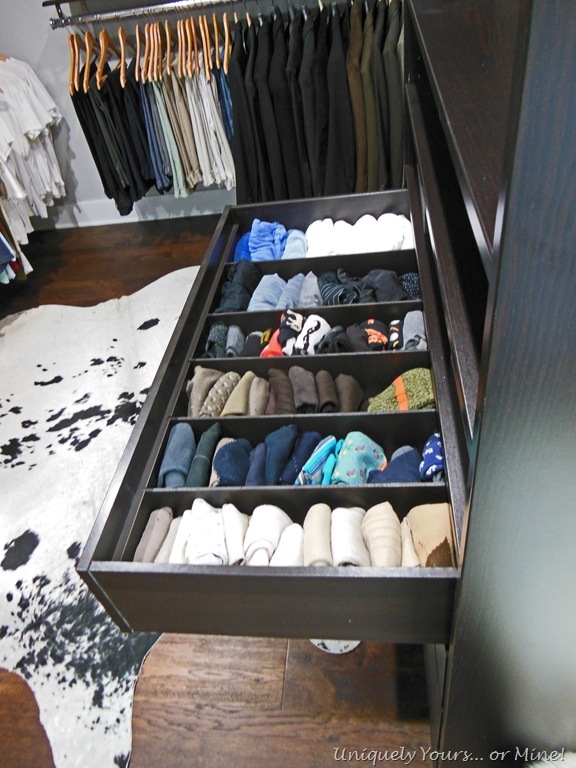 I love the insert and drawer options that are available for these wardrobes, but they are missing some options I’d love to see them add at some point. I thought I could find a simple drawer organizer that would work for us, but no one seemed to have just what I was looking for so I designed a simple, no fasten system for the drawer and we built it and painted it to match the cabinet. This really easy and simple project that consist of: 1/2 birch plywood, 5mm Poplar plywood, some white birch veneer tape. First we cut the 1/2” plywood to height and width and then I adhered (with an iron) the veneer tape to the top edge of the board. After the veneer had cooled we trimmed the veneer and sanded the edges. Then using our table saw we ran the boards through 3 times, moving the blade out a little each pass to cut about 1/4” notches on each board at the desired locations. We then placed the boards in the front and back of the drawer and measured for the length of the dividers. We then cut the 5mm plywood to length and width and sanded all of the pieces with 220 grit paper. I spray painted all of the pieces with Benjamin Moore Advance Satin black brown paint that I had custom matched to the Ikea black-brown color perfectly! I took one of the shelves from the wardrobe to my local Benjamin Moore Store and had them color match to it, it was a little bit of a process to get it just right, but they did a fabulous job! I had looked and looked online for a formula or a color someone else had found already, but there was nothing that truly matched it that I could find. I am a HUGE fan of Benjamin Moore paints and their stores, they seem to employ very knowledgeable “paint people” and if need be I can call ahead and have my paint mixed and ready for pickup when I get there… just all around great customer service! I use Bluegrass Paint & Decorating here in Louisville, but when I lived in Richmond I used Virginia Paint Company. Here is a picture of the Ikea Black-Brown paint formula (the formula is for a QUART) for those that may need it, created in Benjamin Moore Advance Satin paint Base 4. The front and back slotted 1/2” plywood pieces are only held in place by the tension of the divider pieces which allows this system to be easily removed or changed around if necessary. 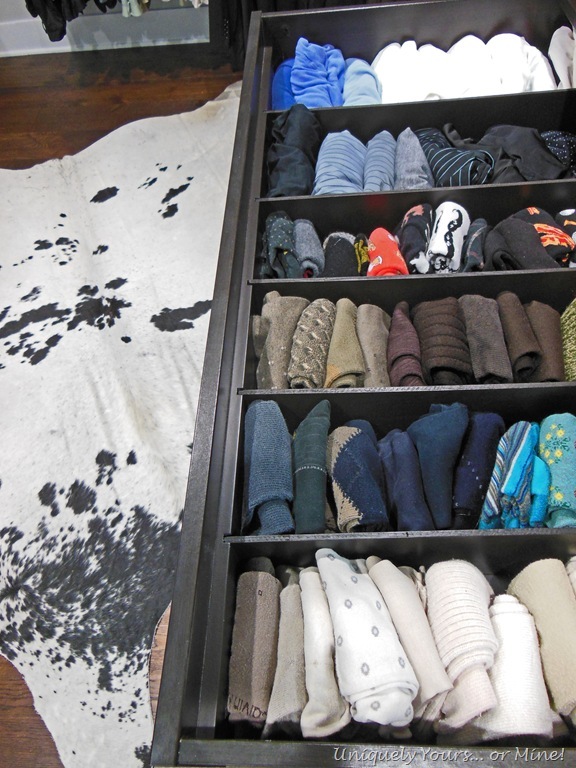 Love me some organized drawers even if they’re not “mine”!!! Thanks Andi! 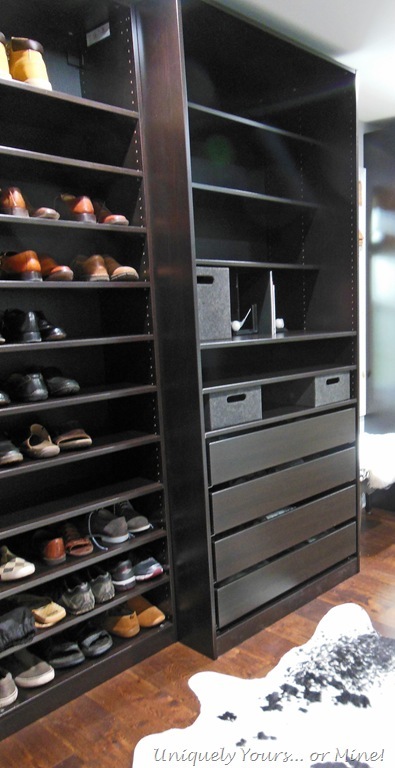 We were planning on building the shoe storage, but building it wasn’t as important as just getting the project completed, which is why we went with the PAX system… And I’m so glad we did! 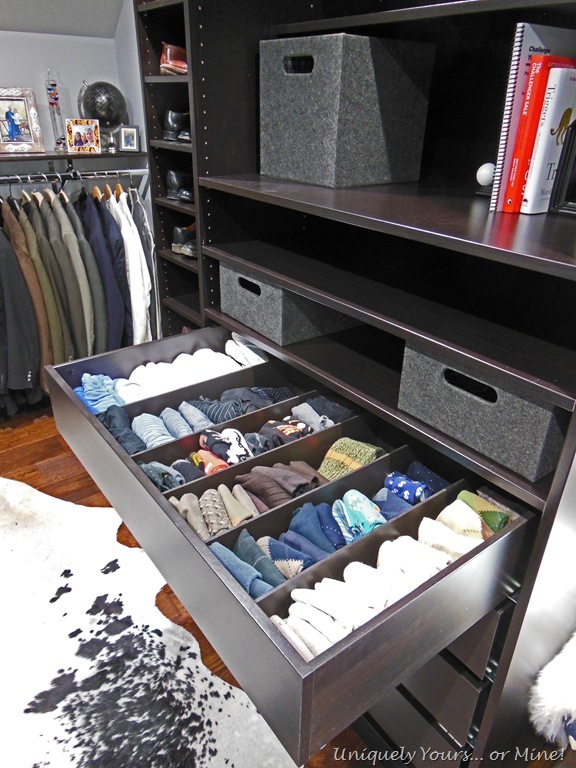 Pingback: Master Closet Turned Dressing Room Reveal | Uniquely Yours... or Mine! Thanks for posting the formula for your paint!! That really came in handy. I thought I would leave a comment to let you know that your label is wrong though. It says gallon, but the formula is actually for a quart. I took it to my local Benjamin Moore store, and they halved the recipe in order to make a quart, and it made a blue-gray instead! So the man working there called up your local store and asked them about your paint blend, whereupon it was discovered that the man who mixed your paint forgot to change the information for the label from gallon to quart! Whoops. 🙂 He remade it and all was well — I used it to paint a shelf that I wanted to match the other IKEA brown-black pieces we have in that room, and it looks great. Soooo much easier than any of the other methods I found while looking for this. Hey Jen! Thanks so much for letting me know this, I will be sure to go back and fix the post so no one else has this issue! I’m so glad the paint worked for you too, BM stores always do a great job at color matching for me! FYI I fixed the can to state “Quart” instead of gallon.. Yes, the photo is of a quart mix of the paint. You’re so welcome! I was hoping it would help someone, good luck! Thank you for saving all of us from experimenting to get the correct paint match! We bought two stained medicine cabinets from IKEA that we want to install over an existing natural maple double vanity base cabinet, which I now will need to refinish to match that black/brown finish. You indicate that you spray-painted. How many coats? Did you sand in between coats? Does the grain show through a little? I’m debating between using a Java Gel Stain or this paint formula, depending upon the grain issue. Thanks in advance for your help with this. 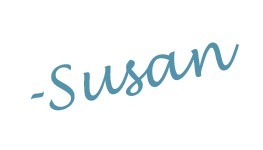 Looking forward to exploring your web page for other gems. I sprayed 2 or 3 light coats, with Bin Zinzzer primer as a base, yes to lightly sand between coats. The doors didn’t have grain on them to begin with so no grain was visible. I think you’ll get the best results with paint, but maybe test first? Good luck with your project!